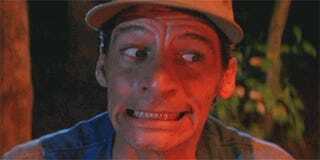 Tonight, we turn to our dear friend, Ernest P. Worrel. Yes, tonight is ERNEST SAVES CHRISTMAS! This cornucopia of corny is headlined by the one and only Jim Varney! He's best known for his Ernest character, and in this film he also pulls an Eddie Murphy and plays 3 additional roles as well! VERSATILITY! He's also the best known actor in the film, so we can expect cinematic gold from this apparent lead brick. So, the standard Movie Night protocol applies: As per the hosting duties, I'll be in the the AIM Chat room tonight around 8:30PM EDT - just look for LoserMLW in AIM, and I'll get you added to the group! For those with streaming services, it's available on Netflix only at the moment. For those without paid streaming, you're on your own. A brief Google search should uncover various ways to partake in this film - please join us, as Ernest will be anxiously awaiting your presence.